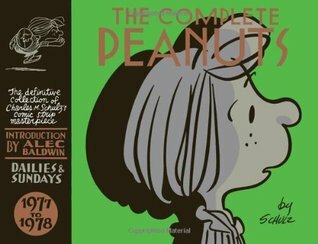 From Goodreads: As the 1970s wind down, the last two recurring Peanuts characters have fallen into place: Snoopy’s brother Spike and the youngest Van Pelt sibling,Rerun. But that doesn’t mean Schulz’s creativity has diminished; in fact, this volume features an amazing profusion of hilariously distinctive new one-(or two-) shot characters!For instance, in an epic five-week sequence, when Charlie Brown, found guilty by the EPA of biting the Kite-Eating tree, he goes on the lam and ends up coaching the “Goose Eggs,” a group of diminutive baseball players,Austin, Ruby, Leland, and—did you know there was a second black Peanuts character, aside from Franklin?—Milo. Also: a tennis-playing Snoopy ends up reluctantly teamed with the extreme Type “A” athlete Molly Volley... who then reappears later in the book, now facing off against her nemesis, “Crybaby” Boobie. (Honest!) Add in Sally’s new camp friend Eudora, the thuggish “caddymaster” who shoots down Peppermint Patty and Marcie’s new vocation, an entire hockey team, and a surprise repeat appearance by Linus’s sweetheart “Truffles” (creating a love triangle with Sally), all in addition to the usual cast of beloved characters (including the talking schoolhouse and the doghouse-jigsawing cat, who gets hold of Linus’s blanket in this one), and you’ve got a veritable crowd of characters. It’s another two years of the greatest comic strip of all time, full of laughs and surprises. Thoughts: Another great two years of Charlie Brown and the gang. Some reviewers have said that they feel this is the beginning of the end of Peanuts - the strip was getting tired. I personally don't find that. It is changing, starting to reflect the societal trends - jogging and tennis feature as prominently as baseball - and take on a more mature vein of humour - less laugh out loud and more appreciative chuckle at a astute observation or realisation. I plan to take a break from Peanuts for a bit, but hopefully not too long!